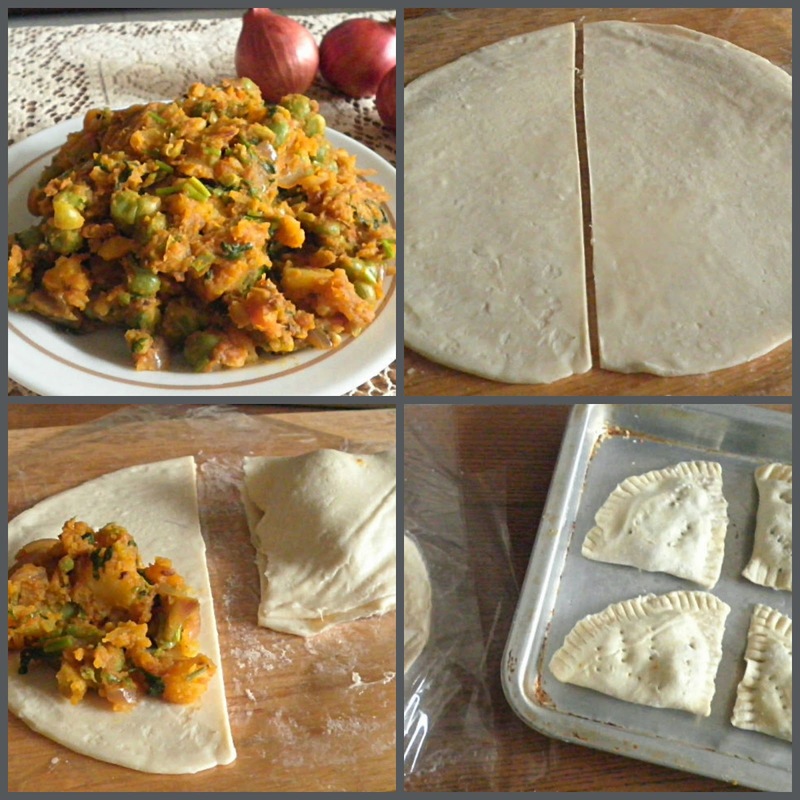 Curry puffs or Asian pies are a favorite for many of us. It was made with flaky pastry, stuffed with curried potato and deep fried until golden brown. But now they came with variety of fillings like sardine, minced meat and hard boiled egg. Nowadays, most people resort to buying from the malls instead of preparing them from scratch. It was tricky and time consuming affair. 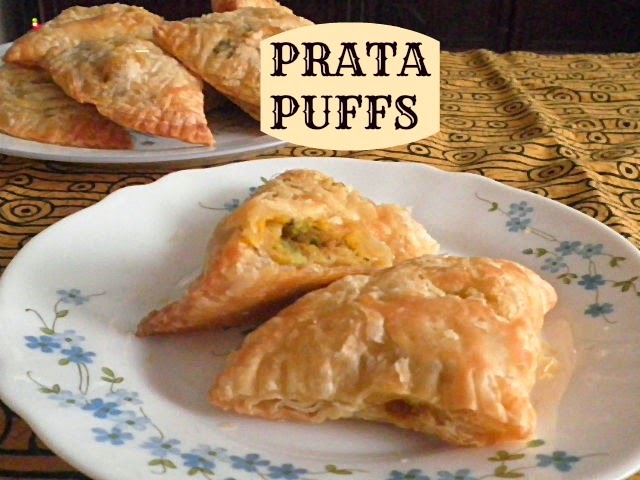 I have seen a few of my friend making curry puffs using instant roti prata so this is a nice chance to try my hand making them. First of all, you need to prepare the filling and let it cool. My filling are made using mashed potato and cooked green peas. You can even substitute the filling according to your preference . Most importantly, do not leave the prata too long at room temperature, it becomes sticky and hard to handle. You can start cutting and shaping immediately after you've removed them from a freezer. If instant prata is not available. you can still make these piping hot snack using puff pastries. Baking the puff is also a healthier option as it removes excess oil and fat. Sometimes we love to skip our regular diet by having various type of noodles, flat bread or even pasta. For today, I'm going to cook my favorite Chicken Noodle Soup. My recipe was a bit different since I have added bird's eye chili, to make it spicier and ground almond for slight nuttiness to the soup. This is the most loved chicken soup by my family. Whenever I cooked any chicken dish, I make sure to remove the skin and excessive fat hidden in between the flesh. You can always ask the poultry seller to remove the skin and cut the chicken according to your requirement, how big you want it to be. In addition of cooked noodle, you can make this heavenly soup with pasta or rice cake (lontong) too. 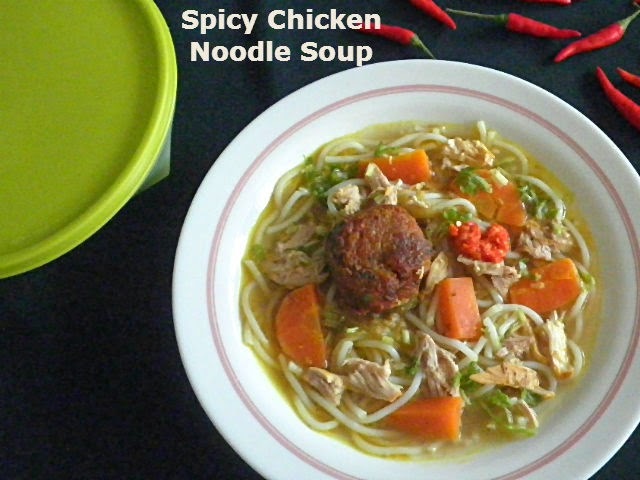 You can control the spice of this Spicy Chicken Noodle Soup by adding more or less chili and also modify the vegetables to your preference. Instead of serving the chicken as it is, you can shred the chicken with your fingers as you pick it off the bone. Simply pull the meat apart into chunks. Warm the belly and heart with a big bowl of Spicy Chicken Noodle Soup. This endless customized recipe is healthy addition to any meal or a great centerpiece dish in its own right. Another brownies for you all. I just can't get enough of them at the moment. Not only because I happen to have a pantry full of their ingredients but also they are so easy to make and taste so delicious. This Eggless Coffee Brownies certainly take the cake. There are so many brownies recipes out there and everyone has a favorite. I'm sure you have one that suits your taste. All these brownies have enough chocolate flavor but varying the amount of chocolate, butter, sugar and flour, the texture of each brownies is quite different. 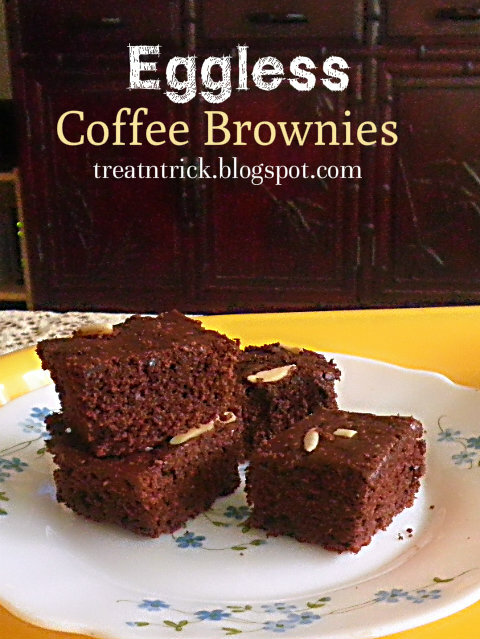 I did minor changes to regular brownies recipe by adding strong coffee. 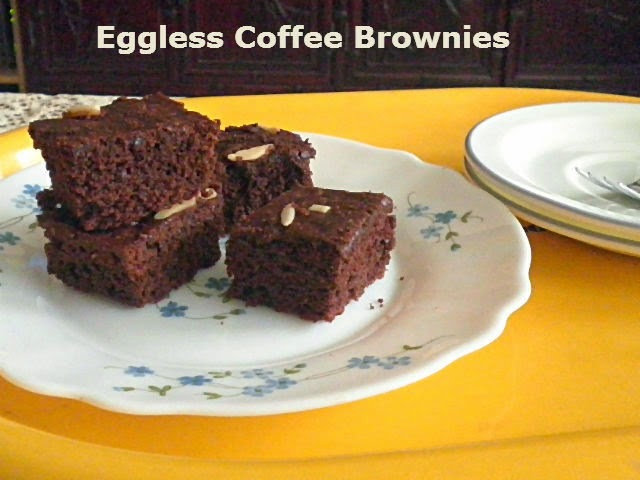 The contrast of flavor of this Eggless Coffee Brownies is extremely good. A fried flat cake of grated potato with onion and freshly ground black pepper. Treat yourselves to a delicious and easy breakfast that was less spiced and much reduced fat. After peeling the potato, soak then in water to avoid discoloration. Had used my hand grater but food processor works fine. This is an egg free version. The most important factor for perfect potato pancake was controlling the heat, high heat will make them browned so quickly but the center was uncooked. Mine done using medium heat. These were surprisingly perfect. 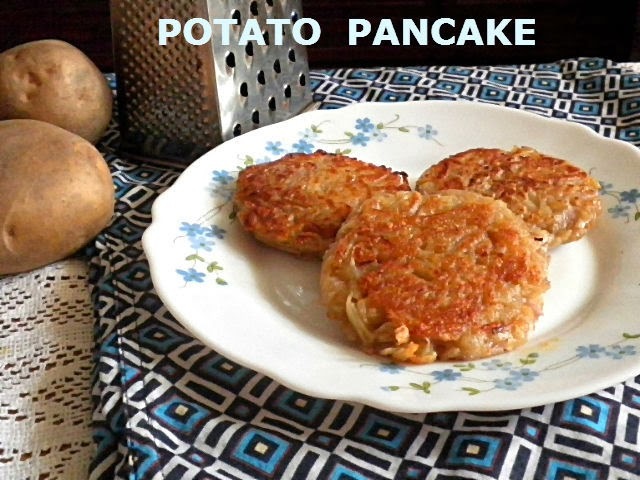 Potato Pancake are best served hot and fresh immediately after you have fried them. 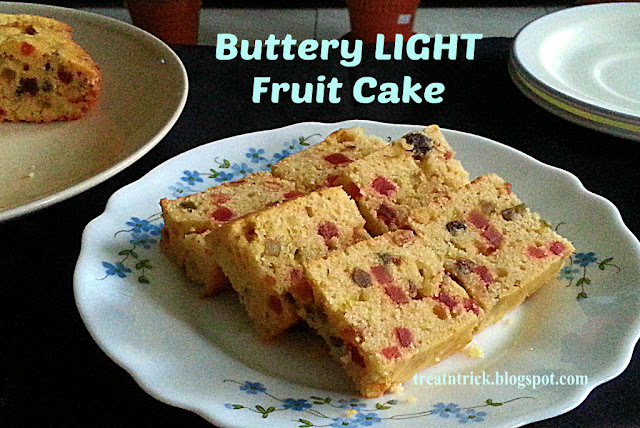 When I bake a cake, I make sure to incorporate fruits into the batter, in this case I had used orange juice. This Orange Cake is a dairy free and egg free recipe. 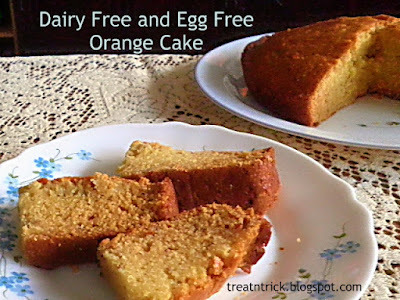 It's amazing how this Dairy Free and Egg Free Orange Cake looks 'normal'. The texture is perfectly moist. 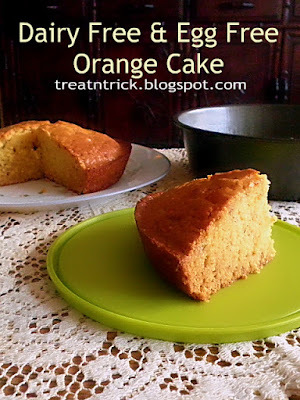 There is a hint of orange that adds a mild tanginess to the cake. I love how the orange juice perfectly compliments the flavor of cake. 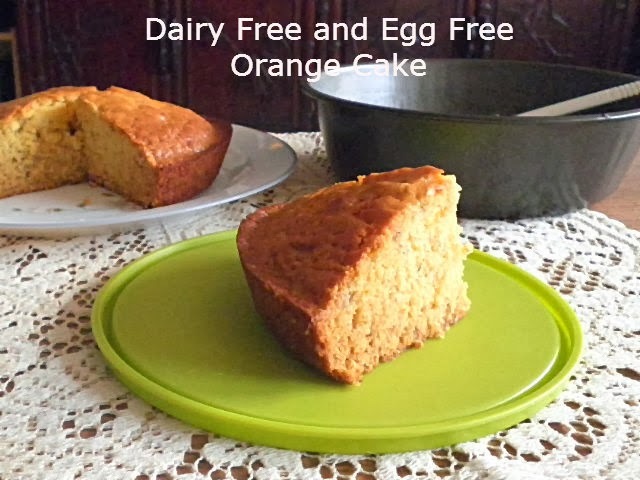 The Dairy Free and Egg Free Orange Cake is darn easy to make, you don't need a mixer at all, simply combining the wet and dry ingredients to form into thick but pouring batter. Make sure to preheat the oven prior to baking and lightly grease the cake pan. Fill only up to half to give room for the batter to rise.